The blade is a Type XVIa from his SL1004, mounted with a 'scent stopper' pommel and a simple cross guard with nice accents at each end. The grip is waisted, cordwrapped leather dyed an 'ox-blood' color. Lockwood also elongated the grip to 8 3/4" (or 10 3/4" including the pommel) to better mirror the geometry of my blunt trainer. Overall (and with little to compare it to as this is my first 'real' sword) I am very pleased. The sword itself is surprisingly light and very lively in my hands with a stiff yet flexible blade. I haven't had a chance to cut with it yet but I'm looking forward to the opportunity. My only criticisms are I do prefer a slightly beefier grip, but that is most likely a product of what I'm used to on my Albion Liechtenauer than anything else, and the peen could have been smoother. 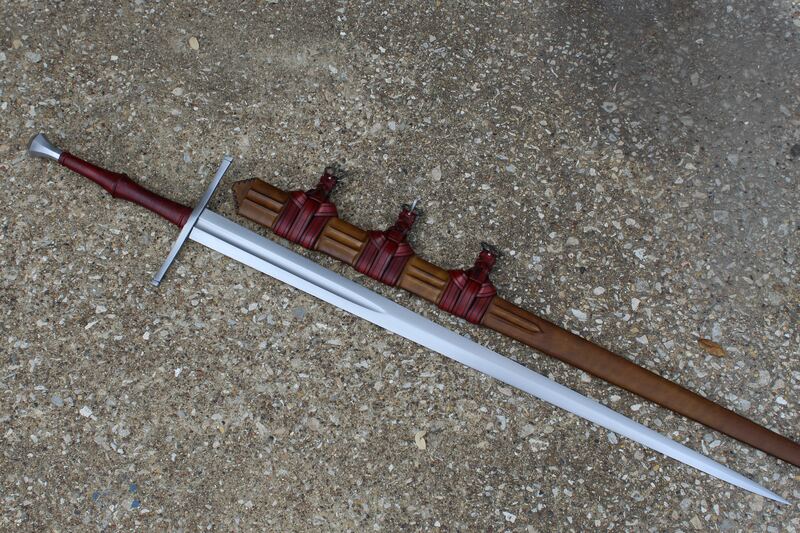 But these are really minor points overall and won't stop me from ordering another Lockwood sword. Chances are high that he'll be hearing from me again. Looks like it came out nice. Would love to see some more pics of the furniture!